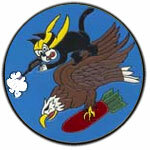 317th FS When Barrie S Davis joined (Appox Mar 1944) the 317th, the squadron had adopted a black panther for its insignia, but it never became the official insignia. After I was with the squadron, we began work on a new insignia which was adopted. I have no idea who did the final artwork, but several of us had input. For example, after deciding on a check-boarded yellow jacket, it took us a bit of conversation to agree on just how the stinger could become a machine gun. It was after the war when I received the embroidered insignia. By General Orders Number 50, dated 30 July 1942, Headquarters Air Force, Eastern Defense Command and First Air Force brought into being and activated 325th Fighter Group. Led by Major Leonard C. Lydon, a cadre of Officers and Enlisted men from the 85th, 86th, and 87th Fighter Squadrons of the 79th Fighter Group proceeded to Theodore F. Greene Field, Providence, Rhode Island, where it became the nucleus of the new group. The 319th Fighter Squadron was born, along with her sister squadrons the 317th and 318th, as part of the 325th Fighter Group, later to become the famed "Checkertail Clan", on June 24, 1942. Activation took place on August 3, 1942. 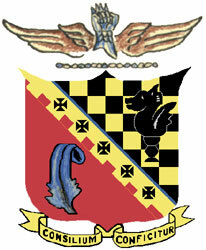 The group headquarters and 317th Squadron were based at Theodore Green Field, Hillsgrove, Rhode Island, the 318th was sent to Grenier Field, Manchester, New Hampshire and the 319th deployed to Renschler Field, Hartford, Connecticut. Jan 7, 1943 -- Loading up with P-40s once again plus 4 TBFs. Jan 12, 1943 -- Rodman (DD) made sub contact. Dropped ash cans (depth charges). Jan 13, 1943 -- Fitch (DD) made sub contact. Dropped ash cans. Jan 17, 1943 -- Ellyson (DD) made sub contact in afternoon. Dropped ash cans. Jan 19, 1943 -- Launching P-40s at 0910 (to Casablanca, Morocco). 6 flights (72 planes). Feb 13, 1943 -- Loading up with P-40s. Feb 13, 1943 -- Left Norfolk at 1300. Rough sea, rolling and pitching. Feb 16, 1943 -- Rodman (DD) made sub contact. No good. Feb 23, 1943 -- Rodman made sub contact. Dropped ash cans. Two tin fish fired at us on our starboard bow. Missed. Feb 24, 1943 -- Corry (DD) made sub contact and dropped 8 ash cans. Launched P-40s. Fitch made 2 sub contacts, dropped 16 ash cans. Feb 25, 1943 -- Contacts during night. Launched all P-40s (to Casablanca). TUESDAY, 19 JANUARY 1943, WESTERN MEDITERRANEAN (Twelfth Air Force) 72 P-40Fs of the 325th Fighter Group are flown off the USS Ranger and land at Cazes Airdrome, Casablanca. SUNDAY, 28 FEBRUARY 1943, HQ 325th Fighter Group and it's 317th and 318th Fighter Squadrons with P-40Fs arrive at Tafaraoui, Algeria from the U.S.
MONDAY, 1 MARCH 1943, The 319th Fighter Squadron, 325th Fighter Group establishes HQ at Tafaraoui, Algeria upon arrival from the U.S. 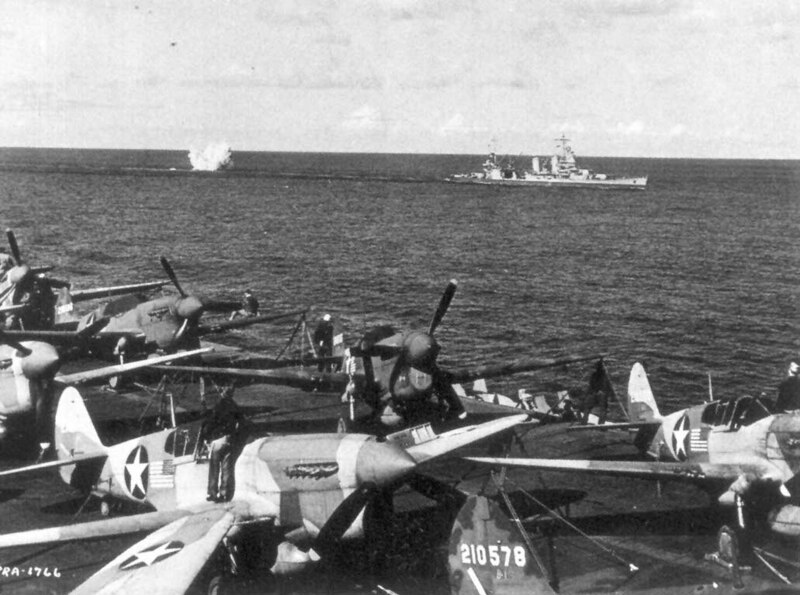 The squadron is equipped with P-40s. MONDAY, 5 APRIL 1943, HQ 325th Fighter Group transfers from Tafaraoui, Algeria to Montesquieu, Algeria. Today starts Operations FLAX (5-22 Apr) which is designed to destroy, in the air and on the ground, enemy air transports and escorts employed in ferrying personnel and supplies to Tunisia. WEDNESDAY, 7 APRIL 1943, The 318th Fighter Squadron, 325th Fighter Group with P-40F's transfers from Tafaraoui, Algeria to Montesquieu, Algeria. 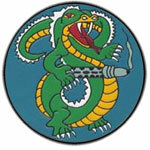 The squadron will fly it's first combat mission on 17 Apr 43. WEDNESDAY, 19 MAY 1943, WESTERN MEDITERRANEAN (Northwest African Air Force), The 317th Fighter Squadron, 325th Fighter Group, transfers with P-40's from Tafaraoui, Algeria to Montesquieu, Algeria and flies it's first combat mission. THURSDAY, 3 JUNE 1943, WESTERN MEDITERRANEAN (Northwest African Air Force), HQ 325th Fighter Group and it's 317th and 318th Fighter Squadrons transfer with P-40's from Montesquieu, Algeria to Souk-el-Khemis, Tunisia. FRIDAY, 4 JUNE 1943, WESTERN MEDITERRANEAN (Northwest African Air Force), The 319th Fighter Squadron, 325th Fighter Group transfers with P- 40's from Montesquieu, Algeria to Souk-el-Khemis, Tunisia. SATURDAY, 19 JUNE 1943, WESTERN MEDITERRANEAN (Northwest African Air Force), HQ 325th Fighter Group and it's 318th and 319th Fighter Squadrons transfer with P-40's from Souk-el-Khemis, Tunisia to Mateur, Tunisia. MONDAY, 21 JUNE 1943, WESTERN MEDITERRANEAN (Northwest African Air Force), The 317th Fighter Squadron, 325th Fighter Group transfers with P-40's from Souk-el-Khemis, Tunisia to Mateur, Tunisia.